It’s an awesome knife, although a bit big for EDC in my opinion. I carry it when I hike and camp though. The blade is actually a modified clip point design, not a drop point. Thanks, Eric. I think you are right as there is a slight trailing point to blade. I have read postings on the Internet that raise concerns with Amazon selling counterfeit Spyderco knives. 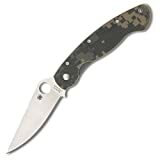 I would prefer buying a Spyderco Military from Amazon because they have the best pricing. Any feedback is appreciated. I have always had good luck ordering from Amazon. Youre pretty safe if the item is sold by amazon and not an outside vendor. However their return policy is excellent so if you get a suspect item you can always send it back.